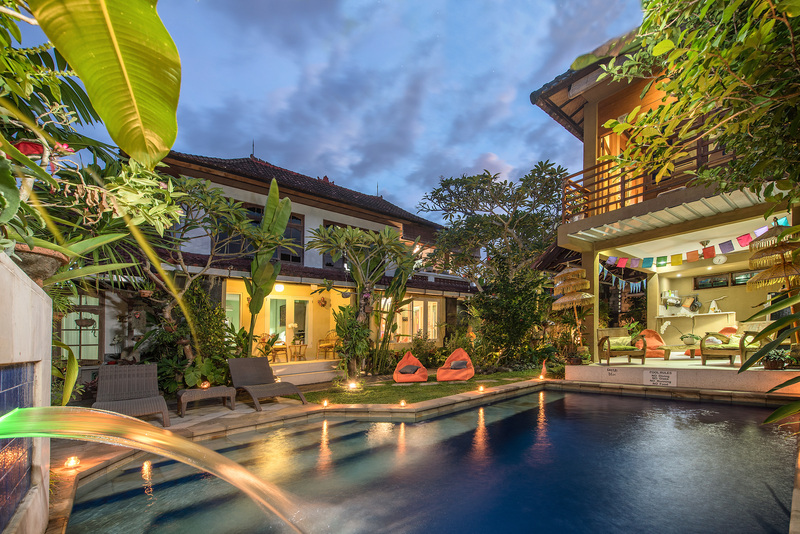 Sandat Suite – Angel House Ubud. Boutique 3 suite hotel or Whole Villa Rental. Authentic Bali experience. Unique Accommodation. The Sandat suite has its own entrance with balcony, comfy chairs and a table. The perfect spot to enjoy freshly cooked breakfast, check emails or just relax and read a book. This room has a king size bed, digital security box and enclosed insect proof ensuite bathroom with non-slip tiles and roll in shower. There is a sofa which converts to a double bed if children wish to share this room and can have 1 extra small bed. The air-conditioned and fan cooled bedroom features custom designed and handcrafted furniture, fine Balinese linens and soft furnishings, reading lights and draped mosquito net. Your suite also comes fully equipped with tea and coffee making facilities and unlimited filtered drinking water. There is a large flat screen wall mounted TV with DVD player. Sandat suite with king bed 200cm x 200cm and draped mosquito net. Orchids on Sandat veranda with hand carved antique sendi/feet on the veranda railing. Mas, the home of woodcarvers. Guest library, lounge area and dining where breakfast is served.